The creditMigrationCopula takes as input a portfolio of credit-sensitive positions with a set of counterparties and performs a copula-based, multifactor simulation of credit rating migrations. Counterparty credit rating migrations and subsequent changes in portfolio value are calculated for each scenario and several risk measurements are reported. creditMigrationCopula associates each counterparty with a random variable, called a latent variable, which is mapped to credit ratings based on a rating transition matrix. For each scenario, the value of the position with each counterparty is recomputed based on the realized credit rating of the counterparty. These latent variables are simulated by using a multifactor model, where systemic credit fluctuations are modeled with a series of risk factors. These factors can be based on industry sectors (such as financial or aerospace), geographical regions (such as USA or Eurozone), or any other underlying driver of credit risk. Each counterparty is assigned a series of weights which determine their sensitivity to each underlying credit factors. migrationValues — Values of the counterparty positions for each credit rating. ratings — Current credit rating for each counterparty. transitionMatrix — Matrix of credit rating transition probabilities. LGD — Loss given default (1 − Recovery). After you create creditMigrationCopula object (see Create creditMigrationCopula and Properties), use the simulate function to simulate credit migration by using the multifactor model. Then, for detailed reports, use the following functions: portfolioRisk, riskContribution, confidenceBands, and getScenarios. The set of all possible credit ratings. The matrix of probabilities that a counterparty transitions from a starting credit rating to a final credit rating. The rows represent the starting credit ratings and the columns represent the final ratings. The top row holds the probabilities for a counterparty that starts at the highest rating (for example AAA) and the bottom row holds those for a counterparty starting in the default state. The bottom row may be omitted, indicating that a counterparty in default remains in default. Each row must sum to 1. The order of rows and columns must match the order of credit ratings defined in the RatingLabels parameter. The last column holds the probability of default for each of the ratings. If unspecified, the default rating labels are: "AAA","AA","A","BBB","BB","B","CCC","D". A NumScenarios-by-1 vector of portfolio values. This property is empty until you use the simulate function. cmc = creditMigrationCopula(___,Name,Value) sets Properties using name-value pairs and any of the arguments in the previous syntax. For example, cmc = creditMigrationCopula(migrationValues,ratings,transitionMatrix,LGD,Weights,'VaRLevel',0.99). You can specify multiple name-value pairs as optional name-value pair arguments. Values of the counterparty positions for each credit rating, specified as a NumCounterparties-by-NumRatings matrix. Each row holds the possible values of the counterparty position for each credit rating. The last rating must be the default rating. The migrationValues input sets the Portfolio property. The migration value for the default rating (the last column of migrationValues input) is pre-recovery. This is a reference value (for example, face value, forward value at current rating, or other) that is multiplied by the recovery rate during the simulation to get the value of the asset in the event of default. 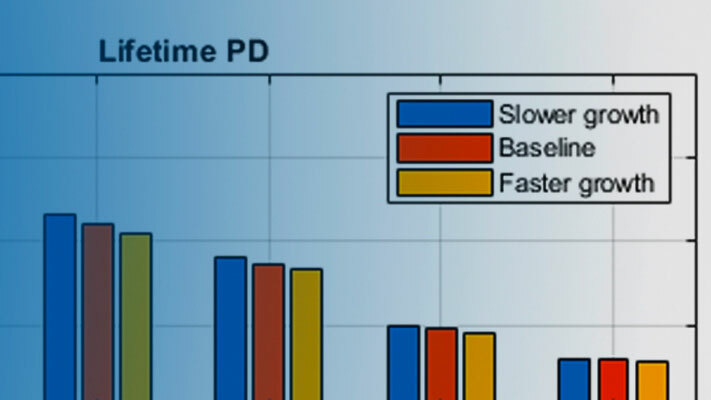 The recovery rate is defined as 1-LGD, where LGD is specified using the LGD input argument. The LGD is either a constant or a random number drawn from a beta distribution (see the description of the LGD input). The creditMigrationCopula model simulates the changes in portfolio value over a fixed time period (for example, one year). The migrationValues and transitionMatrix must be specific to a particular time period. Current credit rating for each counterparty, specified as a NumCounterparties-by-1 vector that represents the initial credit states. The set of all valid credit ratings and their order is defined by using the optional RatingLabels parameter. The ratings input sets the Portfolio property. If RatingLabels are unspecified, the default rating labels are: "AAA","AA","A","BBB","BB","B","CCC","D". Credit rating transition probabilities, specified as a NumRatings-by-NumRatings matrix. The matrix contains the probabilities that a counterparty starting at a particular credit rating transitions to every other rating over some fixed time period. Each row holds all the transition probabilities for a particular starting credit rating. The transitionMatrix input sets the TransitionMatrix property. The top row holds the probabilities for a counterparty that starts at the highest rating (such as AAA). The bottom row holds the probabilities for a counterparty starting in the default state. The bottom row may be omitted, indicating that a counterparty in default remains in default. Each row must sum to 1. The order of rows and columns must match the order of credit ratings defined in the RatingLabels parameter. The last column holds the probability of default for each of the ratings. If RatingLabels are unspecified, the default rating labels are: "AAA","AA","A","BBB","BB","B","CCC","D". LGD can alternatively be specified as a NumCounterparties-by-2 matrix, where the first column holds the LGD mean values and the 2nd column holds the LGD standard deviations. Then, in the case of default, LGD values are drawn randomly from a beta distribution with provided parameters for the defaulting counterparty. For example, if a counterparty’s creditworthiness was composed of 60% US, 20% European, and 20% idiosyncratic, then the Weights vector is [0.6 0.2 0.2]. If unspecified, ID defaults to a numeric vector (1:NumCounterparties). If not specified, the factor correlation matrix defaults to an identity matrix, meaning that the factors are not correlated. Set of all possible credit ratings, specified as the comma-separated pair consisting of 'RatingLabels' and a NumRatings-by-1 vector, where the first element is the highest credit rating and the last element is the default state. The RatingLabels name-value pair argument sets the RatingLabels property. The 'UseParallel' property can only be set when creating a creditMigrationCopula object if you have Parallel Computing Toolbox™. Once the 'UseParallel' property is set, parallel processing is used with riskContribution or simulate. Details of credit portfolio, specified as a MATLAB® table that contains all the portfolio data that was passed as input into the creditMigrationCopula object. The Portfolio table has a column for each of the constructor inputs (MigrationValues, Rating, LGD, Weights, and ID). Each row of the table represents one counterparty. Correlation matrix for credit factors, specified as a NumFactors-by-NumFactors matrix. Specify the correlation matrix by using the optional name-value pair argument 'FactorCorrelation' when you create the creditMigrationCopula object. Set of all possible credit ratings, specified using an optional name-value input argument for 'RatingLabels' when you create the creditMigrationCopula object. Probabilities that a counterparty transitions from a starting credit rating to a final credit rating, specified using the input argument 'transitionMatrix' when you create the creditMigrationCopula object. The rows represent the starting credit ratings and the columns represent the final ratings. The top row corresponds to the highest rating. The top row holds the probabilities for a counterparty that starts at the highest rating (such as AAA) and the bottom row holds those for a counterparty starting in the default state. The bottom row may be omitted, indicating that a counterparty in default remains in default. Each row must sum to 1. Value at risk level used when reporting VaR and CVaR, specified using an optional name-value pair argument 'VaRLevel' when you create the creditMigrationCopula object. Portfolio values, specified as a 1-by-NumScenarios vector. After creating the creditMigrationCopula object, the PortfolioValues property is empty. After you invoke the simulate function, PortfolioValues is populated with the portfolio values over each scenario. Flag to use parallel processing for simulations, specified using an optional name-value pair argument 'UseParallel' when you create a creditMigrationCopula object. The UseParallel name-value pair argument sets the UseParallel property. The 'UseParallel' property can only be set when creating a creditMigrationCopula object if you have Parallel Computing Toolbox. Once the 'UseParallel' property is set, parallel processing is used with riskContribution or simulate. Load the saved portfolio data. Scale the bond prices for portfolio positions for each bond. Create a creditMigrationCopula object with a four-factor model using creditMigrationCopula. The Portfolio property contains information about migration values, ratings, LGDs and weights. The columns in the migration values are in the same order of the ratings, with the default rating in the last column. For example, these are the migration values for the first counterparty. Note that the value for default is higher than some of the non-default ratings. This is because the migration value for the default rating is a reference value (for example, face value, forward value at current rating, or other) that is multiplied by the recovery rate during the simulation to get the value of the asset in the event of default. The recovery rate is 1-LGD when the LGD input to creditMigrationCopula is a constant LGD value (the LGD input has one column). The recovery rate is a random quantity when the LGD input to creditMigrationCopula is specified as a mean and standard deviation for a beta distribution (the LGD input has two columns). Use the simulate function to simulate 100,000 scenarios, and then view portfolio risk measures using the portfolioRisk function. 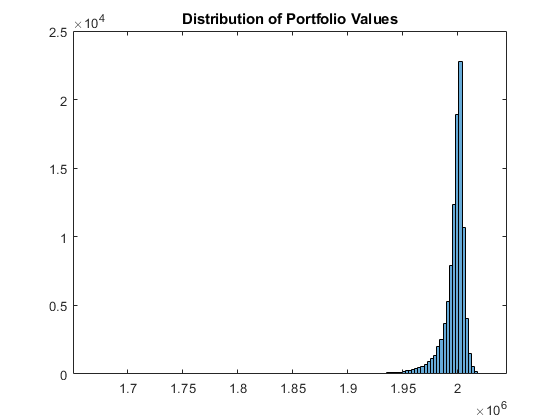 View a histogram of the portfolio values. Use the simulate function to simulate 100,000 scenarios, and then view portfolio risk measures by using the portfolioRisk function. Overlay the value that the portfolio takes if all counterparties maintained their current credit ratings.